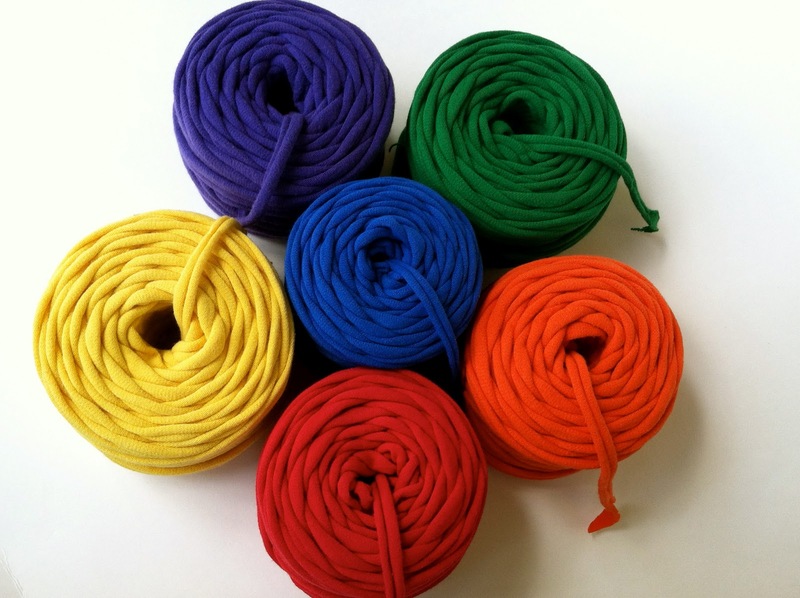 Yarn Geek Heaven: Demystifying T Shirt Yarn Series: What is T Shirt Yarn? I was ready for many things when I opened my supplies shop. I was ready to spend many hours creating inventory. I was ready to spend many hours building up my social networking and involvement in online communities. I was ready to build my accounting system and work out all the business details. I was ready to make mistakes and learn from them. However, I was not ready for the question I would most frequently be asked, "What is t shirt yarn?". The other thing I hear a lot is, "I've seen/heard of it, but haven't tried it because I don't know how to use it". So I have decided to do 2 things with this article. First, I am going to clearly explain what t shirt yarn is and how to use it correctly. Second, I will tell you how to tell what to look for in a high quality t shirt yarn. Third, I will tell you what your expectations should be. Fourth, I will tell you all the ways this is eco friendly. And fifth, I will link you to my t shirt yarn giveaway, where you can enter for a chance to win a literal rainbow of t shirt yarn and try it for yourself for free! Wanna see it? What is T Shirt Yarn and How Do I Use It? Very simply, t shirt yarn is made from t shirts that have been cut into a continuous loop and then carefully stretched into a cord. It usually ranges in widths from 1/8" to 1/4". Depending on the t shirt it is made from it can be rather stiff or it can be very soft and some a little stretchy. Once you learn how to use it, it becomes a very versatile and eco friendly medium to work with. 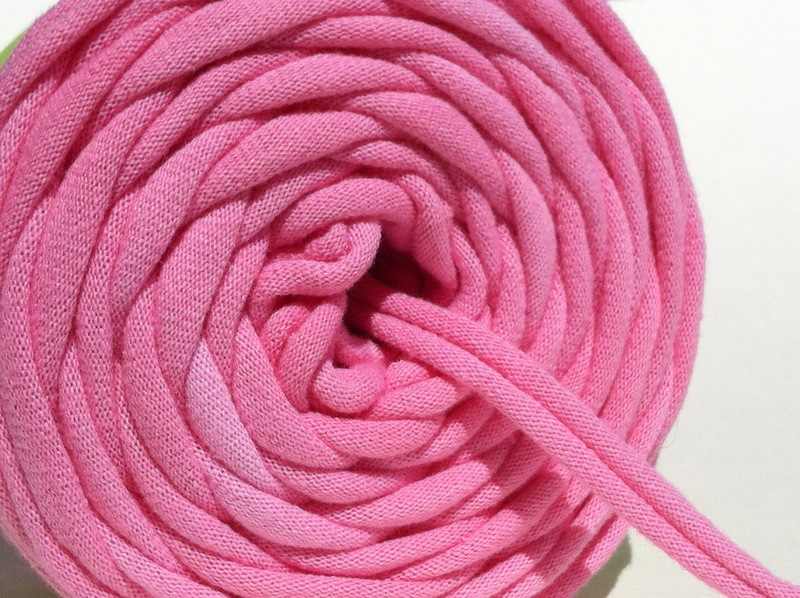 Let's quickly discuss some t shirt yarn terms. T shirt yarn is measured in WPIs. That means "wraps per inch". I like to use a ruler to describe this. So if you wrap a 4 WPI yarn around a ruler you should have to wrap it around 4 times to equal 1 inch. I like to remember that a 4WPI t shirt yarn is 1/4" wide and an 8WPI t shirt yarn is 1/8" wide. The larger the WPI the thinner the yarn is. 8WPI is about as thin of a width as you can get. Anything smaller tends to not curl up well so it is really tattered looking and tends to break easily. So how do you use t shirt yarn? You use it the same way you would any bulky yarn, but there are a few things you should know to help you get started on that first project with t shirt yarn. T shirt yarn has 2 sides. One side is flat and the other side shows the cord. There is not a twist in it like traditional yarns so you will need to keep your yarn straight, by keeping the same side up when holding it in your fingers, to keep it consistent throughout your project. Good t shirt yarn should be a consistent width throughout the entire ball, but sometimes you see a spot that is a little wider. When/if you see this, gently stretch the yarn a bit and it will thin to the width you need. You also need to remember that even an 8WPI, which is usually the thinnest you will see, is still pretty bulky and you will need to use a size J crochet hook (or the equivalent if knitting) to properly work with it. If you are using a bulkier t shirt yarn like a 4 WPI I recommend nothing smaller than a size M crochet hook or the equivalent if knitting. How Do I Look For Quality T Shirt Yarn? See how the ends curl in and there is none of the outer edge showing? That is what you are looking for. Of course, you don't want any stains or any holes from the t shirt showing either. A quality shop will cut any areas with a hole or stain out of it. What should your expectations be? In the world of t shirt yarn, it can be difficult to find matching colors and textures. Just like each t shirt feels a little different, so does each ball of t shirt yarn. For me, that is often part of the charm of it. Each ball is original and cannot be copied. That charm can wear off fast if you are wanting to do a large project and want everything to match. That doesn't mean that you can't use t shirt yarn. Yes, it is difficult to find large lots of matching t shirt yarn, but it isn't impossible. There are a couple of ways you can get around this. First, shops that sell t shirt yarn will sometimes have yarn from event t shirts. These are brand new shirts that are headed for a dumpster, until someone like myself or Mike from Mike's T Shirt Yarn, comes along and rescues it. These are sold in bulk packages and are fabulous for a project that you want a uniform color and texture to, as each ball will be the exact same color and texture. The other option is to use a shop that dyes their shirts. They can dye up a batch of matching balls for you. How is T Shirt Yarn Eco Friendly? Not all t shirt yarn is what I would consider eco friendly, but I am a bit of a purest when it comes to this. Why am I a purest? Because 11 million tons of textiles go to the dump each year. Because creating 1 pound of textiles emits more than 7 pounds of CO2 and the average t shirt wastes 700 gallons of water during manufacturing. You see where I am going with this? There is a great info graphic that shows all of this information on the Naturally Advanced Blog. Upcycling t shirts into yarn is a fabulous way to save t shirt from going to the dump and help reduce the 11 million tons of textile being dumped annually. So what makes t shirt yarn eco friendly? Eco friendly t shirt yarn is usually made from gently used t shirts. The exception for me is event t shirts that a company or group is going to throw away. That being said, when it comes to a product like t shirt yarn, there is room for all kinds of variety. I have seen many people who cut new shirts to make t shirt yarn and others that dye them like I mentioned before. Outside of event t shirts that are one breath away from a dumpster, cutting up a new t shirt to make yarn is in no way eco friendly, as a new t shirt is in no immediate danger of seeing a dumpster. I think dying t shirts can be eco friendly if they are using a used t shirt and the dye that is being used is biodegradable and doesn't contain any harmful chemicals. There is still some water being used in manufacturing these kinds of t shirt yarn, but if handmade the water used would be minimal and certainly no where near the 700 gallons needed in mass manufacturing. Didn't You Say Something About A Giveaway? I most certainly did! If you want to win that beautiful rainbow of t shirt yarn, all you need to do is log into your Facebook account and use this link. Sorry Facebook haters, but this does everything for me, which leaves me more time to make more yarn. The drawing ends on June 30 and there are no shipping charges. I hope that t shirt yarn seems more comfortable to those of you who haven't tried it yet. New mediums can be intimidating to work with if you don't know anything about them. Next month I will be featuring some shops that use t shirt yarn to show its versatility. You will see everything from rugs to baskets to clothing! And then in August I will post an article full of tutorials so you can begin using t shirt yarn yourself! I also want to thank Mike from Mike's T Shirt Yarn for contributing to the article. Thanks so much for sharing how to discern about the t shirt yarn's quality- super helpful! Can't wait to give it a try! Excellent article. I enjoyed your take on what is truly a recycled T shirt yarn. I wanted to comment that even though hand dyed yarn may use biodegradable dyes it still requires several gallons of water. There is the small amount of water to make the dye bath but much, much more water is used for the rinsing and then to launder the finished yarn. Even if biodegradable dyes are used all this water has to be treated before it can be released back into the water supply for the next user. This treatment requires energy and chemicals to complete the treatment process. Therefore, I must submit that hand dying T shirts (used or new) cannot be entirely recycled or ecofriendly. Mike, you are correct. There is water that is used in this process. I was trying to be a little forgiving to the dyed t shirt yarn, but I will agree with you that dying is not an entirely eco friendly approach because of the water used. I know that you are like me and do not dye your yarn because of the water used.